Enjoy Utah! : Salt Lake City Cemetery: Sundance Kid, Ancient Native American Remains, and MORE! 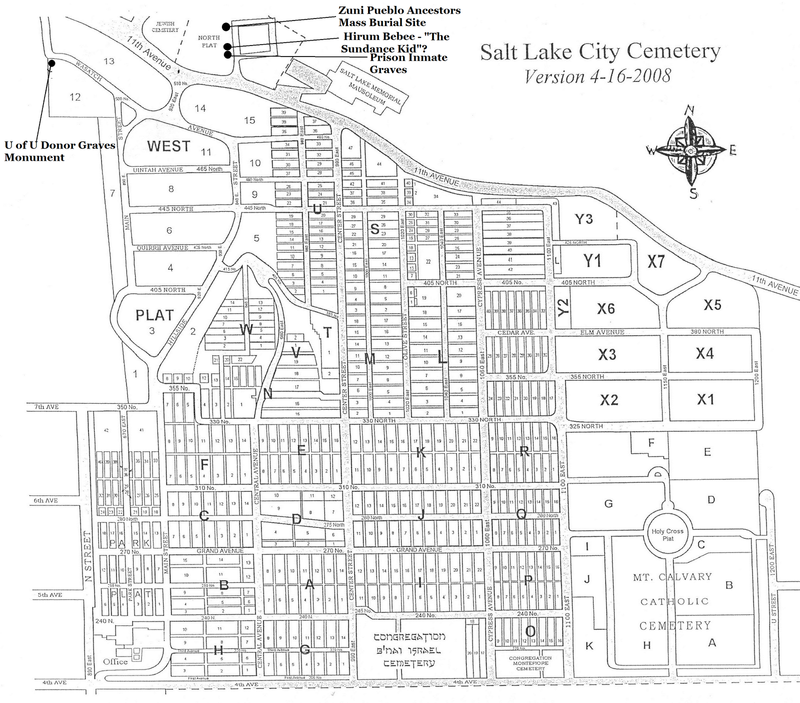 Salt Lake City Cemetery: Sundance Kid, Ancient Native American Remains, and MORE! For many years the Utah Museum of Natural History had a collection of Native American remains in their basement. In 2008, they held a special ceremony and placed all of these remains in one mass grave, with a small marker to indicate the spot where they are all buried in one mass grave. In 1959, four human remains were removed from in or near Steinaker Reservoir, Uintah County, UT. In 1960, 27 human remains were removed from Uintah County, UT. There were three objects found with these remains: two mats and one cloak. In 1990, one human remains were removed from Steinaker Reservoir, Uintah County,UT. The 32 individuals and 3 objects found with the remains are classified as Uinta Fremont based on evidence from physical anthropology, archeology, and location. In 1959, one human remains were removed from Willard Mounds, near the Great Salt Lake, Box Elder County, UT. In 1961, one human remains were removed from in or near the Great Salt Lake, Box Elder County, UT. The above two individuals from Box Elder County, UT, are classified as Great Salt Lake Fremont based on evidence from physical anthropology, archeology, and location. Detailed information about the cultural items, their identification as Great Salt Lake and Uinta Fremont, and the lines of evidence for cultural affiliation, is on file at the Bureau of Reclamation, Upper Colorado Regional Office, Salt Lake City, UT. Additional human remains and objects found with those remains that have been removed from sites in Box Elder and Uintah Counties, as well as Weber County, after November 16, 1990 have also been identified as Great Salt Lake and Uinta Fremon. While craniometric analysis indicates that the Great Salt Lake Fremont and Uinta Fremont were two biologically distinct populations, comparison of basketry and other material culture associated with sites from the two traditions evidences a similar pattern of material cultural manufacture and distribution methods sufficient to identify a single earlier group for purposes of determining cultural affiliation. This earlier group is identified as the Northern Fremont. Craniometric analysis shows the closest biological relationship is between the Northern Fremont and the Zuni Tribe of the Zuni Reservation, New Mexico. Officials of the Bureau of Reclamation, Upper Colorado Regional Office and the Utah Division of Parks and Recreation find the preponderance of the evidence for cultural affiliation with the Northern Fremont to be with the Zuni Tribe of the Zuni Reservation, New Mexico. Officials of the Bureau of Reclamation and Utah Division of Parks and Recreation have determined that the objects found with the remains described above are reasonably believed to have been placed with or near individual human remains at the time of death or later as part of the death rite or ceremony. (See map above)The University of Utah's body donor program was founded in the early 1940s. Cadavers are used to educate health care students and doctors, as well as by researchers developing new technologies. The bodies are cremated after use. If the family wishes to bury them in a family lot, then the remains are given to the family. If the family does not specify that they want to have possession of the remains after cremation, then they are buried in the Salt Lake City Cemetery in the designated area. Once a year on the Friday prior to Memorial Day they have a service for anyone who wishes to attend. You will find this designated area in Plat 12, in the far NorthWest corner. Hirum Bebee - "The Sundance Kid"? (See map above)Located next to the grave of Hirum Bebee is a mass burial of inmates who died at the Utah State Prison. Some died of natural causes, and some were executed. They all have different death dates and years, and their birth dates are unknown. Thanks again to Mark Smith, current sexton of the Salt Lake City Cemetery for helping with this information and research! 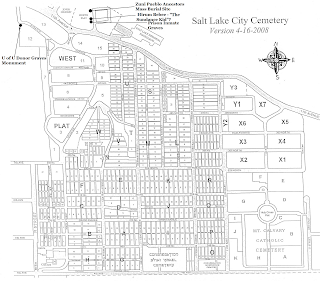 READ MORE about the Salt Lake City Cemetery: Utah's Hidden Jewel!